All calculations based on experience elsewhere, fail in New Mexico. Lew Wallace, Territorial Governor, 1881. Santa Fe is at a higher altitude than where our home is, and there was an enormous (as wide as New Mexico) blue cloud on the radar. Due to the storm that was slowly plodding across the area, the drive was a bit of an adventure. In the end, the total time in the car was about nine hours which is almost double what the typical journey takes. Snow really slows you down. We had splashed out and booked up at La Fonda, one of the nicest hotels in the city, and although it was really only an overnight trip, the hotel made it more special than usual since it was pretty posh. Santa Fe is the capital city of the state, and is an interesting place to visit, interesting for many reasons but for this trip, it was notable as it looked so different in the snow. The small city has an ordinance that all the buildings within a certain distance of the central town square have to abide by certain architectural standards and design, principally based on using adobe, so there is a pleasing symmetry to the streets as you walk around. It’s an arty community with citizenry from both ends of the income spectrum, but mostly wealthy. It’s a little bit like walking around a rich area such as Aspen, with lots of expensive art shops and restaurants all with the adobe architecture that reflects the area’s influence from the numerous First People’s tribes. The hotel’s version of the classic Christmas gingerbread house… Adobe! It was great to get out of town for a break of sorts, and when we returned home, we still had another week or two before going back to work (which was nice). So, since I haven’t said this yet: Happy new year! May you have peace and lots of good reading! 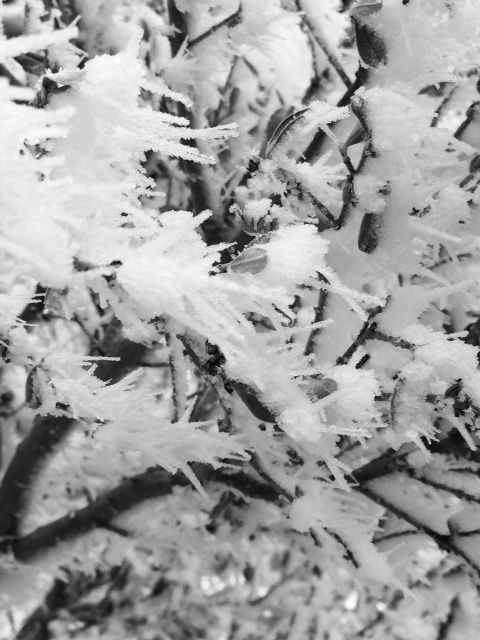 It’s been unusually snowy for the last few days here in West Texas, and since it is rather infrequent for our area, that means that workplaces tend to veer on the side of caution which, for me, meant a SNOW DAY for the entire university. I don’t know about you, but for us here, an entire snow day is almost unheard of and thus there was much rejoicing across the city when this news was announced very early that morning. 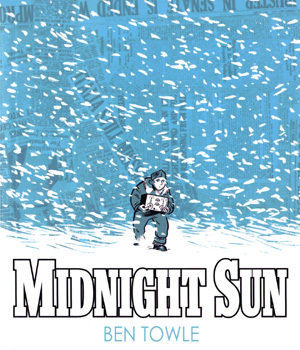 First up on the pile was a small book called “Midnight Sun” by Ben Towle (2007), a GN story that was based on a true historical event in 1928 when an Italian airship crashed in the Arctic on the way back from a trip to the North Pole (an event that I’d never heard of). The group of survivors was composed of men from European countries and theirs was a rather harrowing journey of survival (as were others around that time and before). I am not sure how much of the story was true (apart from the actual crash), but the story seemed pretty non-fiction without any magical realism elements in it and seeing as it featured snow in a starring role seemed an a propos title to start the read. Overall, this was ok but nothing too amazing. 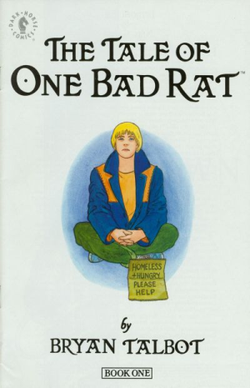 Next was an English GN called “The Tale of One Bad Rat” by Bryan Talbot (1995), an author/artist who has done work with Neil Gaiman, another author out there. 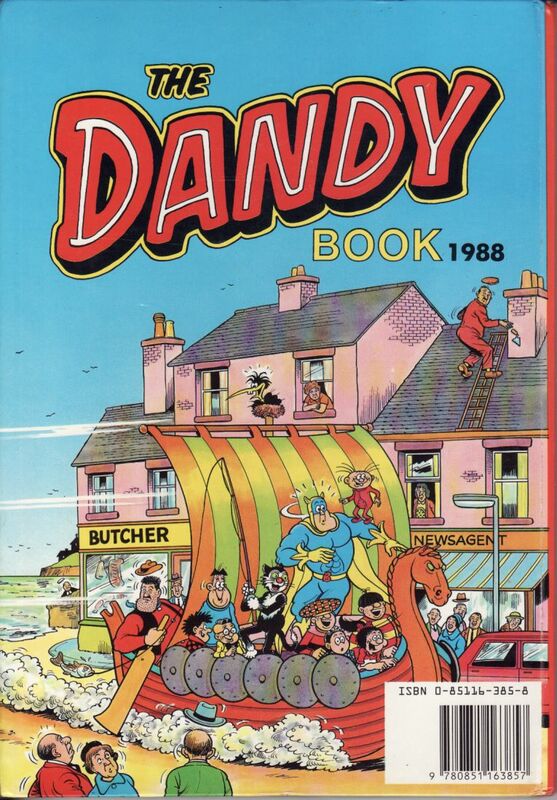 This title was more reality-based (but still fiction) that dealt with a young English woman who runs away from her home to escape ongoing childhood sexual abuse. So – not an easy read, but handled well. The protagonist has a pet rat that she rescued from her school lab and so they’re both on the run from horrible lives. Although this story ends in the way you’d expect it to, it was still a great read (despite the horrible issue) and was very well done. I thought Talbot nailed the slightly gritty side of England really well, and that was refreshing to see. So – this was a good one. 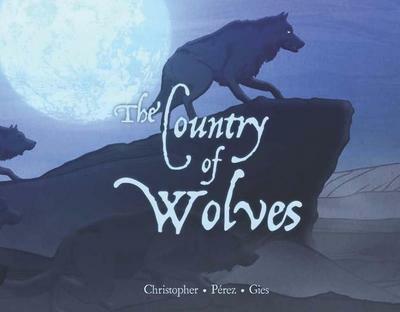 Third up was a GN titled “Country of Wolves” by Neil Christopher/Ramon Perez (2013) and this may have been good, but I didn’t get that far as it was far too scary for me. :-} It did come with a CD of the short animation film of the book, but again – too scary for this feeble creature. And then I pulled out my old Raymond Briggs (UK author) but I’ll save those for another day. This was a fun way to spend the day, and thanks to the Weather Gods for providing us with a nice snowy day. 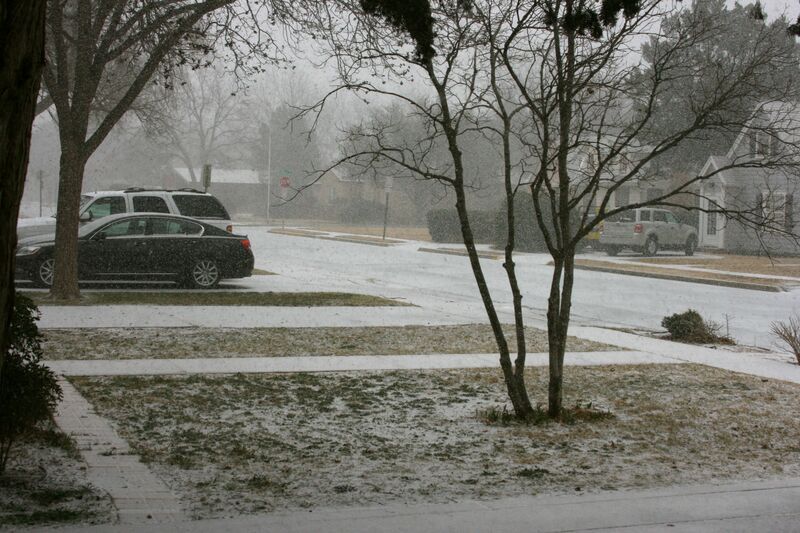 Here in West Texas, the weather can be somewhat unpredictable and extreme at times – extremely hot, extremely cold, and sometimes in the middle. Yesterday meant a huge snow storm (for around here). 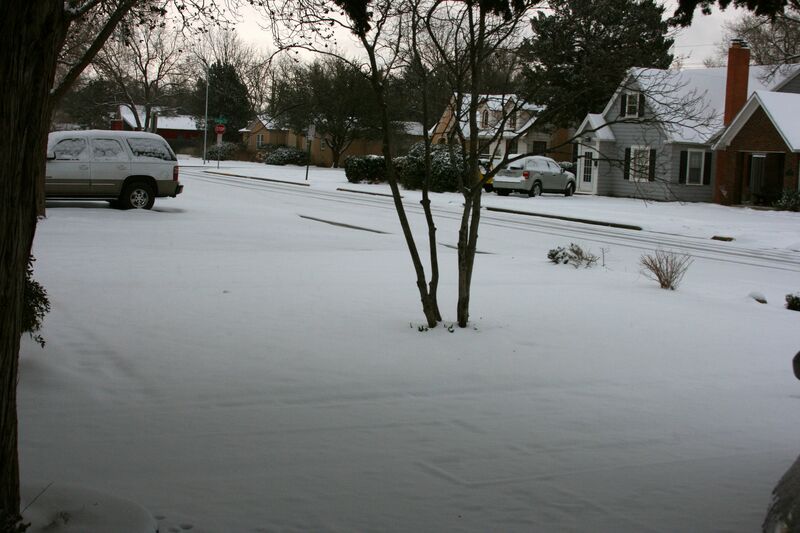 We knew the storm had been coming – lots of it on the news – but still, I was surprised at how persistent the snow was. 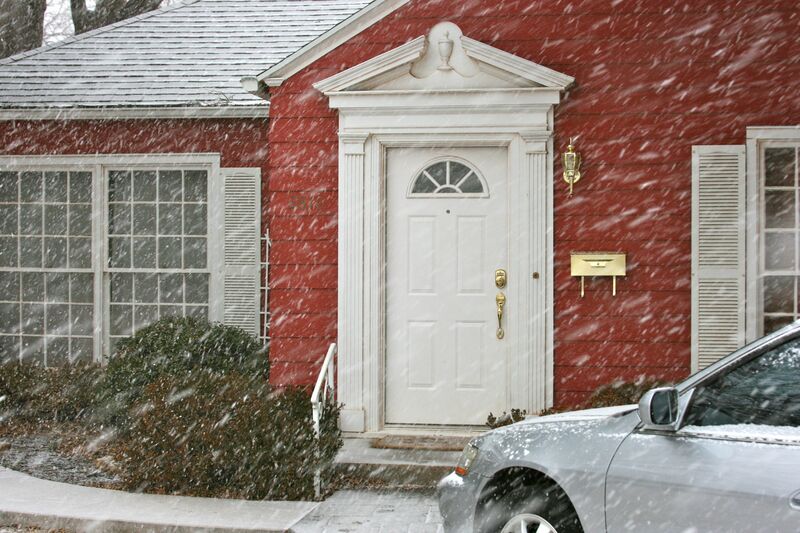 It snowed on and off (but mostly on) for all of the daylight hours of Sunday. As I do not have that much snow experience, I found it to be hypnotic when I gazed out of the window at the flakes falling from the leaden sky. There were a lot of really huge snowflakes floating around, and it was easy to fall into a reverie after a while if you weren’t careful. Perhaps you get used to this if you are exposed to snow a lot where you live – to me, it was fascinating. The finished product (above). (Shiny because the recipe made a big point about brushing the crusts with melted butter right when the loaves came out of the oven to prevent a hard crust.) I thought the loaves would be taller (i.e. rise more), but perhaps that is what the elusive bread flour does. 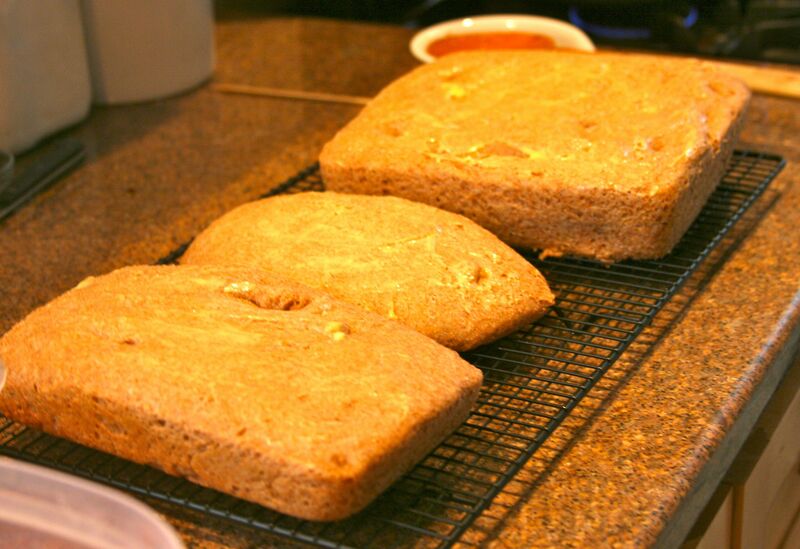 The loaves tasted really good (especially warm from the oven and slathered with strawberry jam), and the kitchen smelled fantastic. I think someone should bottle that smell as an air freshener. Yum. 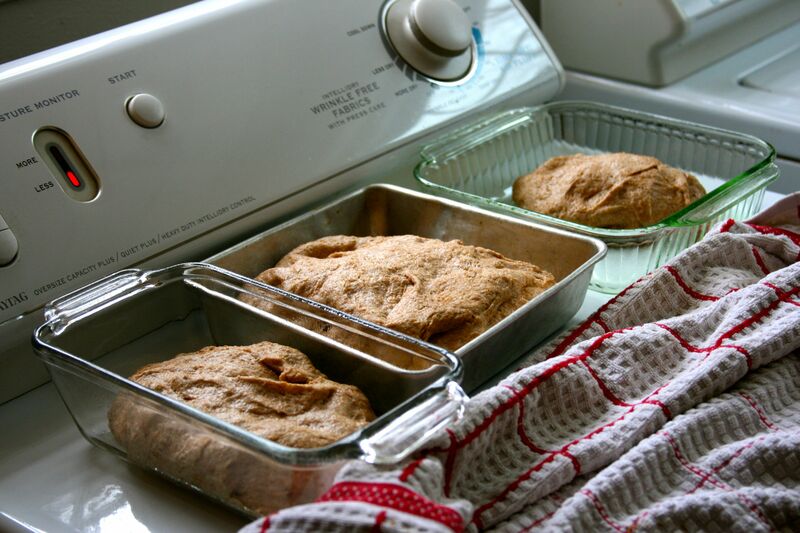 So, this was my first experiment with the bread world (without using a bread machine which we had, never used and sold), and I quite enjoyed it. 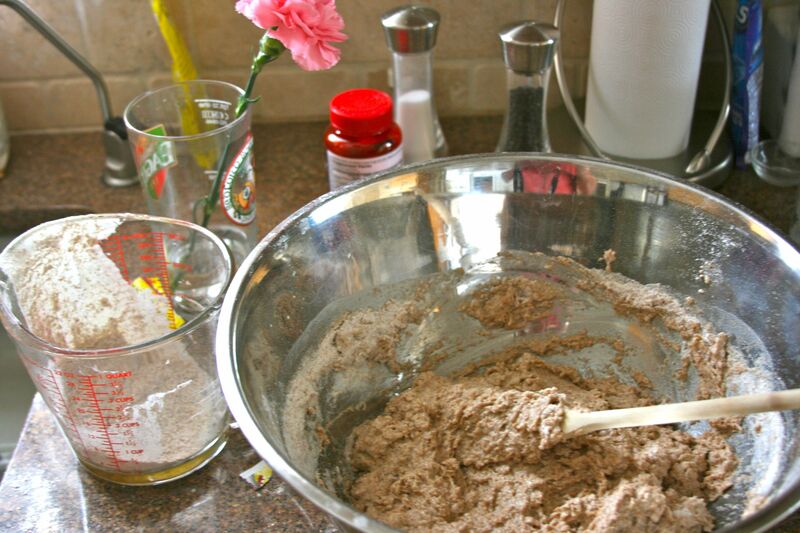 I don’t think making bread will become a regular habit, but this was the perfect day for it and I actually had all the ingredients and the time to do it. Good times. MONDAY UPDATE: This being Lubbock, Texas, most of the snow is now melting, it’s going to be a high of about 70 degrees, and the sky is bright blue. Odd weather. It was about five degrees yesterday (as the high when 32 is freezing). Avi Puppy loved the snow as well. Muttley the Ancient One, not so much. Both cats, of course, bolted into the house as soon as the door was opened. They know a warm place when they see it.